Welcome to Bicycle Riding For Boomers. 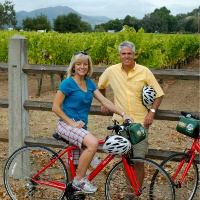 We offer tons of advice on bicycling from a boomer’s perspective. This is seldom seen in the cycling world and can help you select the perfect bicycle or tricycle for your style, your needs, and your budget. But we don't stop there. Also included are helpful tips on all aspects of cycling including tips on safety, trails, cycling news and a bunch of other stuff that you aren't likely to find elsewhere. As an avid bicycle rider for over 20 years I have probably made all of the mistakes I could make along the way. But, the good news is, after thousands of miles and years of research I have learned a lot that I will share with you to make your cycling experience a hassle free way to get fit and have fun. We are not all the same and there is no “one size fits all” especially as we age! Selecting the proper bicycle, or tricycle ,and accessories has a HUGE impact on how much you enjoy riding and how well it serves you in the long haul. Bicycle sizing is critical as well. There is an exciting re-awakening in the world of bicycle riding driven by boomer aged riders looking for fun and fitness. It is an awesome way to attain fitness and how many other exercise programs are actually fun? If you are having fun you are much more likely to stay with it and reap the many health benefits that it gives you. Old-line bike manufacturers are producing more products for mature riders and new manufacturers are appearing frequently. The cycling industry has finally noticed that bicycle riding boomers are a huge market that they can no longer ignore. The days of bicycles being just toys for the young are long gone! Older folks are finding new bikes that are boomer- friendly and new ways to enjoy them. New trails, clubs, and organized rides are becoming more available then ever and the numbers are growing every day. Cycling can be as solitary or social as you want it to be. Charity rides are a great way to have fun and help worthy causes. Even if you live in a hilly area where riding is a bit tougher you have a good option. Electric bicycles are pedal optional so you can pedal for exercise or activate pedal assist as you need it. They are environmentally friendly and can save a bundle on local travel expenses. An estimated 80% of the average persons travel is, with just the driver and within 10 miles of home. With gasoline prices approaching $2.50 per gallon in the USA imagine how much money bicycle riding can save you!